I am still thinking about it. How true it is? Yes he is right that everything starts in the mind but does our balance of mind depends on the surroundings as well? But I differ this point for raising a child. For a child to grow up into a balance human being his surroundings are most important. I feel once you are an adult only then can we mange to handle unbalanced situations with a balanced mind. Thus for a child it is a must that hisenvironment and the people around are peaceful, empathetic, loving and responsible. It had been ages since I had cooked anything Chinese. 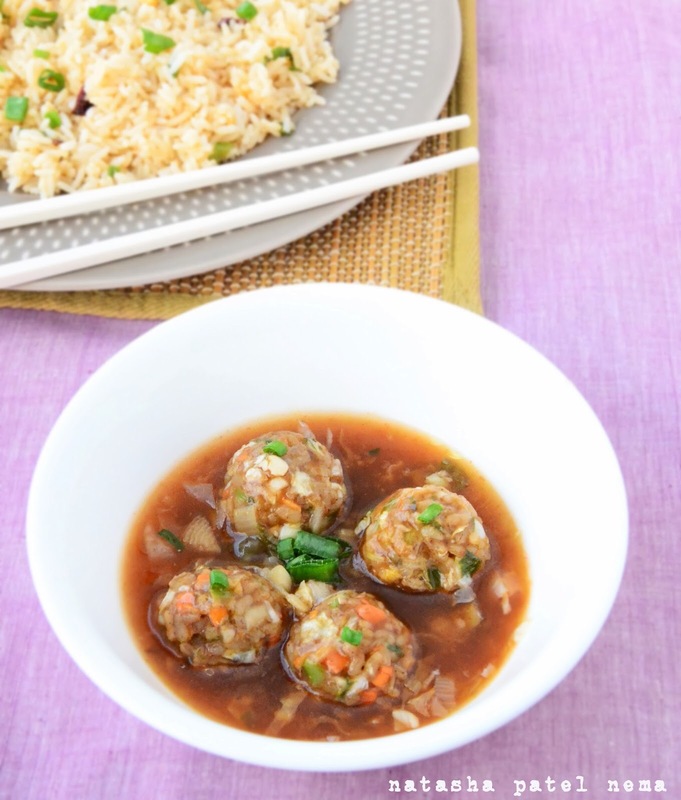 So finally decided to make this brown rice Manchurian. I wanted to eat a healthier version so I steamed the rice balls and shallow fried them, which made the process lengthy but you can cut short the process by simply deep frying the rice balls. I have adapted this recipe from a recipe I found on the blog Padhus Kitchen. Being a complete Desi, I love Indian Chinese. Mix the vegetables, garlic, ginger, green chilies, flour, soya sauce, chili sauce, cooked rice and salt. Mix everything with hand till the mixture becomes sticky. Once done steam them for at least 3 minutes or till they are done. Once done drain them on a paper towel and keep aside. Heat the oil in a pan, add the ginger and garlic and cook for a few seconds. Add the cabbage and cook for 2 minutes till the cabbage is done and slightly brown; add the green onions and green chilies and sauté on a high flame for a minute. Add 2 cups of water, soya sauce, chili sauce, salt and pepper. Mix well and bring it to a boil. Put the gas on low flame and add the cornflour mixture and keep on stirring. Let it cook for 2-3 minutes till the cornflour is cooked and the gravy is thickened. Taste the gravy for some seasoning, make additions accordingly. Put the balls in the gravy when you heat it to serve. This tastes best with fried rice. Tip: While making the rice balls if the rice and vegetables are not sticking to each other then add four and water accordingly. This looks absolutely delicious. I’ve never made vegetable balls like this.